Concrete is a complex material of vital importance to the civil engineering and construction industries. Strength and Related Properties of Concrete addresses the most important single property of concrete its strength with the goal of contributing to concrete′s technical and economical improvement. The book is unique in containing, in a single volume, all of the quantitative tools needed to evaluate, understand, and improve concrete quality. This hands–on guide demonstrates how to fine–tune the composition of concrete to maximize its strength. It presents the best numerical relationships for concrete technology that are currently available, examines them experimentally, and illustrates their practical applications. It also provides a basis for improving both the fundamentals of concrete technology and the way this technology is taught to engineering students. Computerized formulas for strength testing are included on a floppy disk. Anyone involved in concrete technology, from engineers to concrete manufacturers, will find this practical reference book an indispensable tool. Compressive Strength of Hardened Concrete. Strength Development of Portland Cement. Structure of the Hardened Cement Paste and Concrete. Relationship Between Composition and Strength of Concrete.
" This book is prepared very nice and orderly. The reader who deals with civil, mining, and geotechnical engineering gets benefits that will improve their knowledge about concrete which is important for construction. 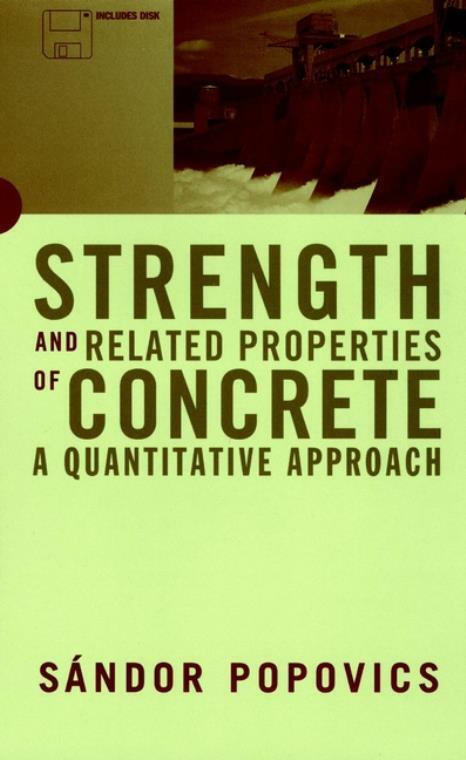 This book could be thought of as a practical and theoretical handbook for readers who deal with concrete. For them it serves as a nice reference book."